The AeroCube 12 (AC12) program consists of two nearly identical spacecraft that will demonstrate new star-tracker imaging sensors, a variety of nanotechnology payloads, advanced solar cells, and an electric propulsion system on one of the two satellites. The experiments performed with the AC12 program will build upon technologies tested on the AC8 CubeSats, which were launched in 2015 and 2016. The Contractile Properties of Smooth Muscle in Microgravity project is a research/educational venture led by the Craft Academy in collaboration with its partner Morehead St. University, in Morehead, KY. This project is the second of a two-part experiment that seeks to evaluate the involuntary cell contractions of aortic smooth muscle cells in a microgravity environment. This research could lead to a better understanding of the contractile mechanism that operates within these cells to control blood pressure, which could ultimately lead to novel treatments for high blood pressure. This payload will also be the first to fly with power inside the MERLIN refrigerator facility. Successful demonstration of this capability could significantly improve how cell culture research is maintained until reaching the ISS. EnduroSat is a multipurpose CubeSat platform engineered for space applications and research. Two communication modules and deployable antennas will deliver a highly reliable communication system for telemetry, tracking, and command as well as transmission of data. A network of actuators and sensors to enable spacecraft control and processing capabilities will be provided through the low-power-consuming and high-performance onboard computer. 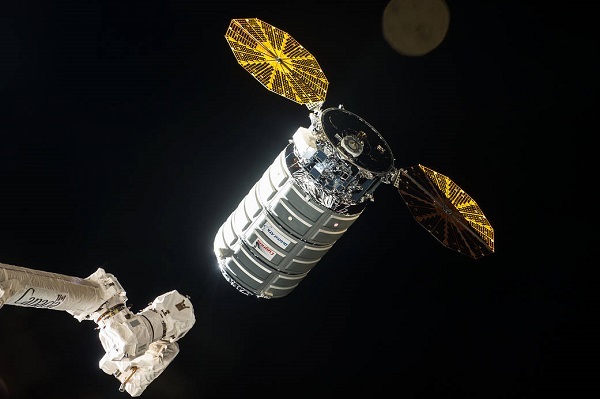 This project seeks to examine genetically engineered E. coli bacteria in microgravity to better understand the metabolic pathways involved in the bacteria’s production of isobutene. Isobutene is a key precursor for numerous products such as plastics and rubber and is primarily produced through petrochemical processes. This project seeks to identify metabolic pathways in E. coli that can be genetically modified to increase bioproduction rates of isobutene. Hardware Partner: Space Technology and Advanced Research Systems, Inc. The Biological Nitrogen Fixation in Microgravity via Rhizobium Legume Symbiosis experiment, led by the Higher Orbits Go For Launch! program, seeks to examine how microgravity affects the nitrogen fixation process during the growth of a well-known legume, microclover. Automated laboratory modules maintain germination and growth conditions while atmospheric nitrogen is measured throughout the mission. Gaining a better understanding of the biological nitrogen fixation process in a microgravity environment could be valuable in advancing technology that aims to progress the field of commercial biological nitrogen fixation soil nutrition. The International Space School Educational Trust (ISSET) Multi-Experimental Module is a set of educational experiments to be performed and evaluated in microgravity. Students are investigating the effects of the space environment on both life science and physical science experiments. The ISSET Multi-Experimental Module will contain three independent investigations: The Immiscible Liquid Separation experiment will observe the mixing and unmixing of oil and water in microgravity. The Effect of Hydropriming on the Growth of Basil experiment will examine the growth rates of microbasil seeds that either have or have not been hydroprimed prior to launch. And the Movement of Polar Liquids Across Electric Fields experiment will observe the effects of microgravity on how polar liquids move across electric fields. Tracking of oceangoing ships is of limited use. Information is gathered and delivered infrequently to those who need it, making it useful almost exclusively for historical understanding. Thus, it loses its value “in the moment” for real applications for both the public and private sectors, which is problematic given that 90% of global trade transits over the ocean. Spire’s many small satellites provide close-to-real-time information from anywhere on Earth. In the maritime sector, these satellites increase safety and security across the planet’s oceans (for example, search and rescue, piracy prevention, etc.). With results from this research, Spire will begin deployment of its full constellation of satellites to deliver near-real-time updates on maritime and weather data from anywhere on Earth. CubeRRT is one of four projects selected for the In-Space Validation of Earth Science Technologies program within NASA’s Earth Science Division. CubeRRT will assist in demonstrating technologies for Earth-sensing microwave radio meters. This will enable scientists to remotely sense properties like soil moisture, sea surface temperature, atmospheric water vapor, sea surface winds, and others. EQUiSat will be deployed as a low-cost CubeSat and educational outreach mission. Brown Space Engineering will preserve EQUiSat as a low-cost and documented open source project. This will allow for others unaffiliated with the project to utilize EQUiSat’s subsystems without the dedication of large budgets or extensive expertise. EQUiSat’s secondary mission is to test viability of LiFePO 4 Batteries. LiFePO 4 batteries have never been flown in space; however, they have notable advantages over conventional batteries. LiFePo 4 batteries have high current draw capabilities and less risk of thermal runaway than opposing lithium-ion batteries. HaloSat will be equipped with X-ray detectors and seeks to determine whether there is a hot baryon gas halo around our galaxy. The goal of this mission is to map the distribution of the hot baryon gas surrounding the Milky Way and to determine whether it fills an extended halo or if it is compact, with no contributing mass to the galaxy. The payload consists of three XR-100SDD X-ray detectors (silicon drift defectors, or SSDs). This dedicated CubeSat enables an instrument design and strategy to maximize the detection of the halo signal, while subsequently minimizing possible foregrounds from solar wind charge exchange interactions. Memristor Satellite (MemSat) is developed by Rowan University to fly a memristor evaluation payload. Memristors are electronic devices that will be stored within the payload and can be retained during power-off modes. This will allow for energy-efficient power management and system resiliency in power failures. The mission is to characterize the behavior of memristor memory devices and compare them with silicon-based memory technologies. The RadSat-g (Radiation Satellite) is a mission developed by Montana State University as a technology demonstration payload. The demonstration consists of the validation of a new radiation-tolerant computer system and radiation sensor in low Earth orbit. The computer system achieves radiation tolerance through a variety of fault mitigation approaches to recover from possible failures caused by high-energy ionizing radiation. TEMPEST-D,1 (Temporal Experiment for Storms and Tropical Systems – Demonstrator) is a mission designed to provide risk mitigation for the TEMPEST mission that includes six satellites. TEMPEST-D,1 will provide the first temporal observations of cloud and precipitation processes on a global scale. This is significant because TEMPEST will enable a better understanding of the linkages between Earth’s water and energy balance and help to improve understanding of how cloud model microphysical processes are necessary to predict climate change. Quest Institute Multi-Experiment, Educational Investigation #2 is a multi-experimental payload that encompasses 14 independent life science and physical science mission objectives. The payloads consist of experiments looking at rice decomposition, lactococcus fermentation, slime mold growth, the effects of different plant nutrient solutions, and a material to prevent the growth of E. coli in microgravity. The spacecraft’s primary mission will be a demonstration of the concept of operations for an optical data relay. The CubeSat shall receive transmission from the ground and/or from beta-test customer spacecraft already on orbit and store the data on board. The CubeSat shall downlink the data to the ground using laser communication. The mission objectives are to prove the utility of a data relay service for current satellite operators. Increasing the data throughput for current and future satellite users will greatly increase earth observation and monitoring science downlinked to scientific and commercial users. This can increase mission payload utility for any customer satellite operator. The Space Tango Hot investigation will examine the thermal effects of heating and cooling methods in microgravity in the absence of convection. This investigation will use thermal imaging and a grid of temperature sensors to map how active temperature disturbances are transferred within a sealed container. The Continuous Liquid-Liquid Separation in Microgravity investigation will use a unique liquid separation system for liquid-liquid extraction. Unlike common separation methods, which rely on liquid sedimentation, the Zaiput Liquid-Liquid Separation system relies on surface forces to accomplish liquid-liquid extraction. Separation based on surface tension is thought to be a method independent of gravity; however, it has never been tested, and the physics of the process remain somewhat unclear. Exploring microgravity’s effects on the process could improve understanding of the physics involved. Results from this investigation could allow Zaiput to further develop their system and potentially scale up the system to achieve flow rates suitable for chemical production. To learn more about these investigations and other station research, visit www.iss-casis.org.